I had never made an angel food cake, as it always seemed difficult and it needed a special pan. I remember reading somewhere that you could use a bundt pan that has a hole in the center of the pan, in place of the angel food cake pan. Until just a few years ago I didn’t have one of those either, as I usually make my cakes in a 9×13 pan, when I actually make a cake. That is, until I got the recipe for Apple Cake, which is absolutely delicious, from my fellow homeschool mom (Thanks Kay!) and it requires a bundt pan. Consequently I bought one because I loved this moist yummy cake and didn’t want to take any chances that the pan may have been important to it turning out right. Besides, I wanted a bundt cake pan. We frequently have LOTS of eggs around here because of our chickens but they are molting and not providing many eggs right now (at least I hope that is the reason we aren’t getting many eggs at the moment). At any rate, I was hungry for Angel Food Cake with strawberries. I didn’t have enough fresh eggs to make one from scratch. Did you know it takes a full dozen eggs to make an angel food cake? That’s crazy! Thankfully I had a box of angel food cake mix on had. 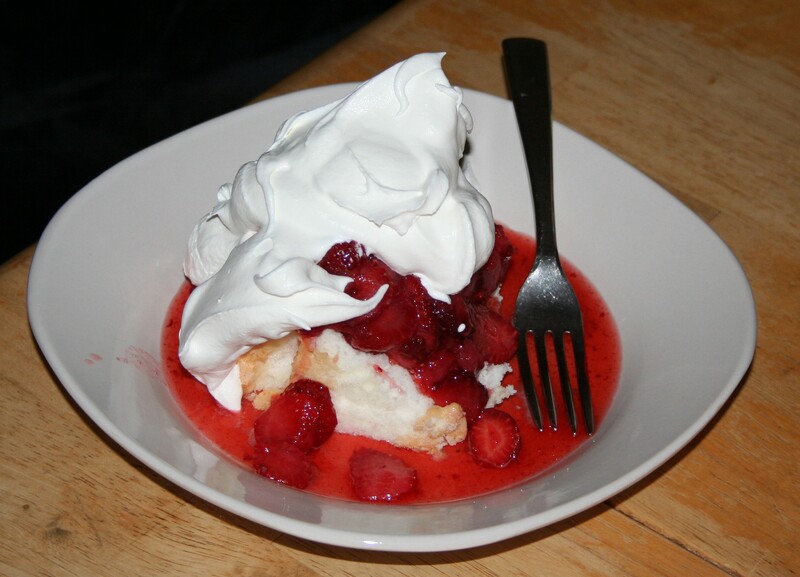 A year or so ago I had found this recipe, and I use the term lightly, for 3-2-1 cake, which uses angel food cake mix to make a single serving dessert. Well, that was all gone, so I thought I’d get another angel food cake mix to have on hand, in case I felt the urge to make that again. So I decided to give it a try since I had some strawberries in the refrigerator that desperately needed to be eaten. So here is the super difficult ‘recipe’. Buy Angel Food Cake Mix from store. Find some bottle to fit in the hole of your bundt cake pan. Slice strawberries and sprinkle with enough sugar to coat them nicely and refrigerate. When it cooled I used a rubber spatula to loosen the cake from the pan. Slice and serve with strawberries and its juice, and whipped cream. Buy one angel food cake mix and any other cake mix you like. Combine both cake mixes and store. When you are ready for a single serving dessert, combine 3 tablespoons of the mix and 2 tablespoons of water in a microwave safe bowl, ramekin, or cup and microwave for about 1 minute. Eat!